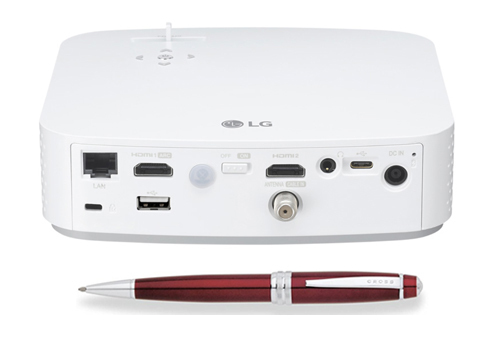 The wraps are off the tiny new LG PF50KA full-HD 1080p projector with built-in LG Smart TV capability. 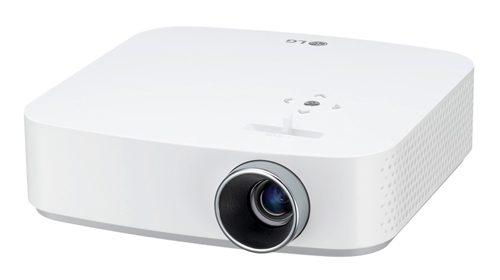 This 600 lumen projector delivers image sizes up to 100" at an introductory promotion price from LG of just $549.99. It features a 30,000-hour illumination life and even comes with a built-in 2.5-hour battery for presentations when AC power is unavailable. At just over two pounds, the PF50KA is very portable and sports dual 1-W speakers. Its two HDMI inputs are complemented by two USB inputs, one of which is Type C that can charge laptop and mobile devices from the same cable that carries the HD signal. To expand its reach, the PF50KA offers USB plug-and-play for wireless projection of movies, photos, and selected Microsoft Office files. The LG PF50KA, at an introductory price of $549.99, is a bargain for a full HD projector, and its built-in Smart TV tuner is a surprising addition for such a low-cost projector. Apps such as Hulu, Netflix, and YouTube are provided. Think of it as an inexpensive flat-screen TV replacement for rooms where ambient light is not a problem. There is even a direct connection for cable/antenna. The battery built into the PF50KA will provide about 2.5 hours of viewing time without any connection to AC power. Backyard get-togethers and mobile presentations in remote locations are two examples of the utility of this unusual feature, and the battery recharges quickly for extended viewing. The PF50KA has two HDMI inputs along with dual USB connections, one of which is Type C with simultaneous recharging capability. Video and photo files on memory sticks can be plugged directly into a USB input. Additionally, there is an RF-45 input for network connections, and the PF50KA can also sync up with mobile devices via Miracast or WiDi. While the built-in dual 1-watt speakers may suffice for a presentation to a small group, there is a Bluetooth audio capability for driving external speakers for larger gatherings. The fan noise from the PF50KA is very low, even at maximum brightness. The LG PF50KA has a very small footprint (6.7" x 6.7" x 1.9"), and at only 2.2 lbs it is ideal for portable home theater and video in any area where you can turn the lights off, either indoors or for back yard movie nights.